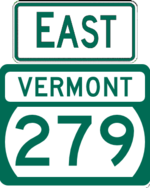 VT 279 is a mostly two-lane, non-divided freeway bypassing Bennington. The portion between VT 67 and US 7 was completed in the early 1970s and designated as the VT 67A connector. 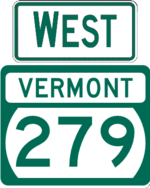 It was extended to New York in 2004 and was designated VT 279. It was extended again to VT 9 in 2012 and plans call for a further extension to US 7 south of Bennington.